It's Not Just Clothes: Prices Of Many Things Heading Higher : The Two-Way As commodities, labor and utilities all cost more, companies are going to try to pass those increases along to consumers. 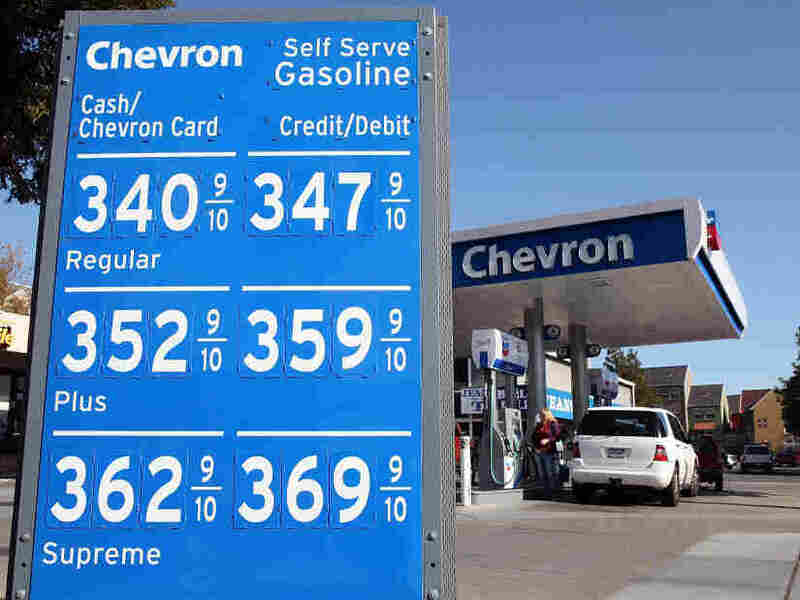 One of the most visible signs of higher prices: The prices for a gallon of gas at a station in San Rafael, Calif., late last month. As Eyder wrote yesterday, it looks like clothing manufacturers are going to try to raise prices by as much as 10% this spring. "A package of Oscar Mayer cold cuts. A pair of Nine West boots. A Whirlpool washing machine. By the fall, people will most likely be paying more for each of them, as rising prices hit most consumer goods, say retailers, food companies and manufacturers of consumer products." Everyone who drives also knows about higher gas prices, of course. Rising costs for a variety of commodities, from cotton to cooper and all sorts of foods, are a major reason. Also to blame: higher labor and utility costs. The good news, according to the Times: "Economists say the increases may eventually show up as inflation, though they are not yet projecting rates that would set off alarms."